History, Membership, Exhibitions: Schools of Painting & Sculpture. and Timeline of Art History. The Royal Academy of Arts (RA) is an independent body, headed by eminent artists and architects, whose aim is to promote the creation, enjoyment and appreciation of the visual arts in Britain, largely via exhibitions, education and debate. A centre of excellence for academic art in Britain, its counterparts in Europe include the Academy of Florence (Accademia dell'Arte del Disegno: founded 1562), the Academy of Rome (Accademia di San Luca: founded 1583) and the French Academy of Fine Arts (Académie des Beaux-Arts). The RA was founded in 1768 and initially functioned as a school teaching drawing, painting, and sculpture to promising young artists. The possibility of starting a new national art school had been mooted 13 years earlier by a group of rich art patrons and enthusiasts, known as the Dillettanti Society, who discussed the idea with the St. Martin's Lane Academy, run by the celebrated 18th century artist William Hogarth. Alas, nothing came of it. Meanwhile, however, the Society of Artists, an association of the leading British painters, including both William Hogarth and Joshua Reynolds, as well as the famous portrait artist Thomas Gainsborough, was experiencing a number of internal rows. Following an acrimonious dispute between two members - the architects, Sir William Chambers and James Paine - Chambers quit the Society and in 1768 managed to secure the approval of the British Monarch George III, to set up a rival society, to be called the Royal Academy of Arts. 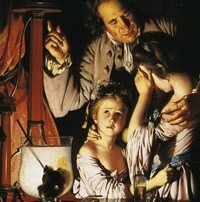 An Experiment on a Bird in the Air Pump (1768) By Joseph Wright of Derby RA. The RA, championed by both Sir Joshua Reynolds and the celebrated American history painter Benjamin West, started out in modest premises in Pall Mall, where it began with 40 Academicians and 20 (later 30) Associates. Reynolds, became its first President and was succeeded by Benjamin West. It offered free tuition in traditional drawing and painting, while scholarships were also provided to assist needy students. In the absence of any outside funding, the Academy lived off the attendance fees it charged for public exhibitions of paintings by members. In 1771, the Academy relocated to Somerset House, and when, in 1837, this building was requisitioned by the government, the RA moved to Trafalgar Square, where it shared accomodation with the National Gallery. Three decades later, in 1868, it moved to its present location at Burlington House. In addition to its role as a fine art school, and in keeping with its founding principle to 'mount an annual exhibition open to all artists of distinguished merit', the RA also offered talented artists the opportunity to draw attention to themselves at an annual Summer Exhibition sponsored by the Academy. This juried exhibition, staged each year from May to August, acted as a launching pad for numerous careers, including that of JMW Turner (1775-1851) who at the age of 15 became the youngest ever exhibitor at the RA. During the 19th and early 20th century, being elected a full Academician was probably the most coveted award for any artist. Even today, in our post-Modernist, post-YBA world, RA membership remains the ultimate official distinction. Membership of the academy is limited to 80 Academicians or "RAs", from areas such as painting, sculpture, engraving, printmaking or architecture, and all must be "professionally active in Britain". On attaining the age of 75, they are promoted to Senior Academicians, thus creating vacancies for new Members, who are both nominated and elected annually by existing RAs. One condition of membership requires each Academician to donate one of their works to the Academy's Permanent Collection. The list of previous Royal Academicians includes such luminaries as Sir Joshua Reynolds, John Constable, Thomas Gainsborough, JMW Turner and Edwin Lanseer, while current Members include artists like David Hockney, Tracey Emin, and Anish Kapoor, as well as the architect Sir Norman Foster. As far as its present activities are concerned, the Royal Academy - now a Charity - has broadened its mandate and now, in addition to teaching some 60 young artists each year (in modern times students have included John Hoyland, Sir Anthony Caro and Sandra Blow), it hosts regular exhibitions of art work selected from around the world. Indeed, it has become one of the foremost art galleries in the world. True, like all traditional academies of art in Europe, the RA has attracted criticism for its conservative approach, but it endures as one of the most influential teaching and exhibition centres in world of 21st century art. Entirely self-supporting, the RA is financed by private sponsorship, as well as its Friends organisation of 85,000 members, the third largest of its type in the world. See also: Best Art Schools. Staged continuously every year since 1769, the Academy's annual art show - now known as the Summer Exhibition - attracts up to 10,000 works, selected by Academicians chaired by the President. Unfortunately, such is the number of works displayed that viewing facilities are typically overwhelmed. In 2004, the most distinguished works in the Royal Academy's Permanent Collection (such as the Michelangelo Tondo) went on display in the newly renovated John Madejski Fine Rooms at Burlington House. In addition, the Main Galleries and the Sackler Wing at the RA are home to a continuous program of prestigious loan exhibitions, enhanced by an extensive agenda of educational resources, including seminars and debates. 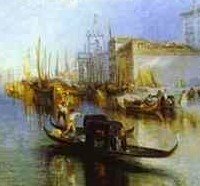 These shows have included masterpieces of Renaissance, Baroque, Impressionism, Expressionism, Cubism, Surrealism art (to name but a few of the major movements), as well as contemporary or avant-garde art. In 1997, the Royal Academy staged "Sensation" a collection of works by Young British Artists (YBAs) owned by advertising magnate Charles Saatchi, which aroused no little controversy. Lastly, there are usually two art shows each year featuring work by Royal Academy students. Here is a brief selection of some of the famous visual artists who gained full membership of the Academy. Barret, George Senior (1732-84) Landscapes.  For more about academic painting/sculpture, see: Homepage.